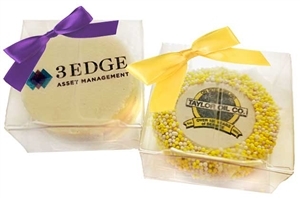 These special logo Oreos are covered in white or milk chocolate coating adorned with the image of your choice. Choose sprinkled borders or no sprinkle borders. Each Oreo is individually boxed with a minimum order of 12 gift boxes. One image per 12 boxes. Oreos are not individually wrapped.Gift box has choice of metallic gold stretch ribbon or satin ribbon bow. Image size is 1.875". Everything is FDA approved and 100% edible.